Happy birthday, chuuni! Let's pretend I didn't start this in the beginning of June. Untold amounts of thanks to virtualdon for patiently repeating Silver facts ad nauseam whenever I asked. You're a great friend! Silver is feeling cocky today. There seems to be an endless army of wild Pokémon and trainers in Union Cave, each intent on blocking him from Violet City. At first it had been annoying, but now he enjoys seeing Totodile tear through one opponent after the next—proving that he is strong, and the others are weak. He hears a rush of wingbeats from behind him. He whirls with a shout, just barely throwing his arms up in time. The Zubat slams into them, and as it tries to back away, his Pokémon strikes it with a series of fury swipes and sends it fluttering to the ground. Totodile looks curiously at its trainer, waiting for the order to finish it off, but it never comes. Instead, Silver stares at the Zubat, watching the way its mouth gapes, its little fangs flashing in the low light. With no eyes to see with, its ears move this way and that, trying to make sense of its faint cries. Eventually, he kneels down and scoops it up in his hands, surprised by how soft and light it is. Silver fishes a Poké Ball out of his pocket and presses it to the Zubat's chest, capturing it. "It's stronger than the others," he tells his Totodile. "You couldn't knock it out in one hit. That's why." The Pokémon continues to eye him, and Silver scowls. He walks quickly away as Totodile waddles after him. When Golbat opens its eyes for the first time, Silver frowns. "It's about time. Come on." It whimpers a little, and his eyes narrow. "What?" Golbat struggles to fly to its trainer's eye level, and Silver leans back, buffeted by the powerful sweeps of its wings. The Pokémon looks into his eyes—Silver swallows hard—and then starts staring at his bangs. Silver's hand flies to his head to hide his hair from view. "What are you looking at, you stupid bat?" Golbat blinks at the familiar insult and drops to the ground, folding its wings in apology. It tries to gesture at its eyes with a claw. "So you've got eyes. Good job. Most animals do." Golbat shrinks back and its trainer turns away. "You're nothing special," he mutters. The first time Silver wakes to find Golbat's wings around his head and its cavernous mouth inches from his face, he thinks it's a freak occurrence. After the first week, Silver thinks the Poké Ball is defective and spends some precious money to buy a new one—it's worth it, if it means he can get some sleep. After the first month, however, Golbat is still sneaking out of its ball, and Silver begins to realize that it's doing this on purpose. Every morning, Silver pushes the Pokémon away with a shout that that sends it skittering and screeching into the underbrush, or a cave wall, or once, off a cliff. Golbat actually stays in its ball for a few days after that one, but then continues as if it can't help but ignore Silver's shouted commands no matter how many times the young man punishes him. Silver starts to seriously consider dumping his Golbat at a Pokémon Center. It's not just because of this bad habit. The Pokémon is never quite enough, never what Silver needs: it's always the first to faint and the last to learn new moves. "This is the real world," he tells it, the bat flying behind him, ashamed. "Nobody cares about how hard you try. The only thing that matters are results!" He kicks a rock viciously, making Golbat flinch. "I don't have time to baby a defective Pokémon," he snarls. By the time they reach Olivine City, the bat looks thin and worn. Silver brings it to a Pokémon Center and they tell him it's overworked and depressed. Depressed? "If you fought harder, you wouldn't have anything to be depressed about," he says as they leave. Golbat blinks sad eyes at him, and Silver suddenly can't think of anything else to say. Instead, he walks to the gym to see what the next leader looks like, but finds it closed. Running into Lyra outside allows him to vent some of his frustration, but not all; he stomps away to sit on a bench overlooking the ocean and drops his head into his hands. Golbat slumps beside him. Feraligatr looks similarly exhausted, even after the trip to the Pokémon Center, and stretches out on the ground by its master's feet. It takes Golbat a long time to notice its master's trembling shoulders. "Damnit," Silver whispers, "Why doesn't anything go right? I have to hurry, I..."
The bat Pokémon turns to him with a soft, questioning noise, reaching out to touch Silver with a claw. The boy slaps it away. "I'm fine!" he hisses, voice raw. "I'm fine, I'm just—" he abruptly falls silent, scrubbing at his face. "I'm fine," he says to himself, almost pleading; "I'm fine, I—" The boy's head snaps up; "What are you looking at?" The Pokémon flinches back, obediently turning towards at the ocean, and listens to its master as he struggles not to cry. "Don't treat him like that!" Silver turns, slowly. The young boy takes a step back, an ordinary-looking child in shorts and a t-shirt. "He's h-hurt," the boy says. "Stop it!" One of Golbat's eyes is swollen shut and both wings drag on the ground. Silver glances at his Pokémon, then back at the child, his lips twisting into a sneer. "Mind your own business," he says. Silver freezes. For a moment, all he can think about is Lance looming over him, saying that same word: Love. "Love is for fools," he snarls. "A child like you wouldn't understand." He leaves, and Golbat limps after him. The child slips the wounded Pokémon a bit of poffin as it passes. It gently takes the treat from his fingers, then nuzzles the child in thanks. Silver roars that it's moving too slowly, and Golbat is soon tripping to catch up, leaving the boy to stare sadly after them. "'Love,'" Silver mutters. "'Love and trust.' They're useless." But with each repetition, he sounds less certain. The night after Lyra's victory in the Goldenrod Underground is the first quiet night Golbat can remember. 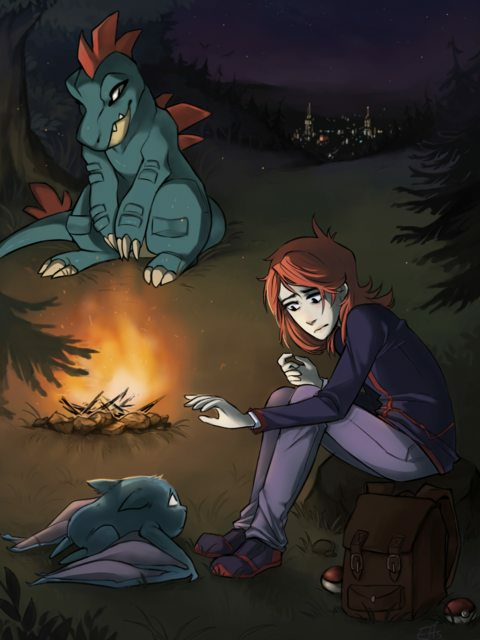 After they visit the Pokémon Center, Silver sets up camp and stares into the fire. Golbat stares, too, but out at the darkness, standing guard. It doesn't like fire. It reminds it of its master's hair, and its master, whom it loves because it doesn't know how to do anything else. It squeaks softly and listens for the echoes, mapping out the area more accurately than it can with its limited sight. Golbat isn't very impressed by colors anymore; its eyes are just another area where it has played catch-up and fallen short. It knows Silver sends it out first in battle to test the opponent's mettle, not to win. The other Pokémon never comment on it, but they don't need to. Golbat closes its eyes and squeaks, again. Its tiny ears move this way and that. Silver has always avoided hitting its sensitive ears; its sense of hearing is its only strong point, and not very useful for battling. Its wings droop. "Golbat?" Silver says quietly, and the bat turns. Is its shift over? Can it go back to its ball now? It is very tired, after losing to Lyra again. It envies her Pokémon, always smiling and strong. It wants to do that for its trainer, but it doesn't know how. If only it were stronger. "Golbat," Silver says again, and Golbat flinches back—its name's been said twice, a hit is sure to follow—but its master's voice is soft and thoughtful. "Come here," Silver says, his bangs shadowing his face. Golbat hesitates, then awkwardly walks on tiny hands and tiny feet over to the young man. Nothing happens, and Golbat blinks. The heat from the fire tickles its skin. It doesn't like fire. When Silver says "I'm sorry," the Pokémon almost misses it. When it realizes, it thinks that even its hearing is going, and now there really will be nothing left. It begins to shuffle away; it doesn't understand. It wants to go back to guard duty, and then back to its ball. It is tired of being in love. "Stop," Silver says, louder, and Golbat does. The boy's head lifts as if it's too heavy. His eyes are watering and filled with pain. "I'm sorry," he says. "I'm a terrible person. I've done...terrible things. I'm sorry." He sees the lack of understanding in his Pokémon's eyes and sighs. "You must hate me, don't you?" he mumbles. When Golbat shakes its head, Silver barks a bitter laugh. "Don't lie to me," Silver says. But Golbat has never learned how to lie. "Love and trust," the young man mumbles. He stares at his Pokémon for another moment, and then extends a hand. Golbat flinches back, and the hand stops. The Pokémon regards the callused fingers, but is too afraid to run away. After a moment, the hand moves forward. Golbat flinches. The hand pauses. It moves forward again, closer. Golbat winces again. Pause. Forward. Wince. Stop. Pause. Forward. Eventually, Silver's fingertips brush Golbat's right ear. It freezes at the contact, eyes wide. The young man's fingers drift down and lightly scratch at the spot where the ear meets the smooth curve of its skull. Silver's touch is clumsy and soft, but Golbat nearly melts at the sudden, unexpected feeling. A purr escapes its throat, and Silver's fingers still; it has never made that sound before. Golbat ducks away and eyes Silver warily. The trainer draws his hand back and stares at it, and then at his Pokémon. "Go to your ball," he says, tired. Silver improves. He gives his team more time to rest. Golbat is allowed more time outside of its ball, and its wings grow in strength from the constant freedom of flight. He gives them compliments when he remembers; at the very least, he scolds less. The hitting stops, and is replaced with the occasional scratch. Golbat gains weight and strength, but it views these changes with confusion. Is this a test? It still makes mistakes, but its master no longer punishes it for them. Who, then, will hit it now? Lyra defeats them again at Victory Road. Silver paces, kicking at rocks and cursing under his breath, but he turns to Golbat and sighs. "Good job," he says, and pats its head, but Golbat shivers in apology and goes to its ball without eating dinner (though its master offers). Golbat understands that Silver is trying, but Golbat isn't good enough to repay him, and it knows when enough is enough. The next morning, Silver jerks awake with a scolding on his lips, ready to yell at his Pokémon for leaving its ball again, but is surprised when his hands meet empty air. He looks down at the six Poké Balls neatly lined up next to him. "Did it listen for once?" Silver mutters, but the moment he touches Golbat's ball, it feels wrong—too light. His eyes widen and he leaps to his feet. He runs through the cave, climbing over rocks and screaming Golbat's name, his voice growing hoarse as the hours wear on. When he finally stops, swaying on his feet, he barely manages to gulp down some water before he calls out the rest of his team to help him look. They search through the night, Feraligatr casting Silver worried glances as they stumble through cavern after cavern. "Golbat," Silver croaks, shaking, "You stupid bat, where did you go—"
And, as before, there is a flutter of wings behind him. They turn, but Silver is too slow this time, and Golbat knocks him to the ground. Silver is too tired to fight; he stares up at his Pokémon as it stands over him, screeching and fluttering. If it were wild, he would be afraid, but instead relief floods him so strongly that it makes his muscles go limp, and he barely finds the strength to lift his hand and touch Golbat's cheek. "You stupid thing," he mutters as his eyes slide shut. "Stupid..."
When Silver wakes, he's at the Pokémon Center. Feraligatr dozes to his right, and—as always—wings are gently cupping his head. He opens his mouth to scold, but then stops, blinking. Where once there had been two wings, now there are four. Golbat—no, Crobat now—leans over to peer at him. Silver glares, and the Pokémon draws back, shifting its weight nervously from one foot to the other. "Why did you leave?" Silver hisses. "Don't make me worry about you, idiot! This is why I tell you to stay in your Poké Ball at night, you stupid—"
He stops when Crobat wraps its wings around him in a clumsy hug. His eyes widen, but he continues to mutter angrily into its ear. "I thought—I thought someone had taken you, or that you'd gotten lost—I thought you—"
Crobat squeezes a little tighter. "...Stupid bat. Stupid, good-for-nothing, useless..." Crobat's wings cover him, and after a long, tense minute, Silver reaches up to hug it back. When Silver and Lyra meet again in the Dragon's Den, he sends Sneasel out first—then Crobat. Lyra turns, surprised, as it explodes from its Poké Ball; he gives her a nod, smirking, and Lyra's eyes brighten. "Congratulations," she whispers, standing at his shoulder and staring out across the battlefield. "Tell him that," Silver replies. "Air Cutter!" He watches Crobat fly wobbly circles around Feraligatr's head as they once again camp along Victory Road. Sometimes, when he's sure no one is looking, he even returns its awkward hugs. But he still yells at it for sneaking out of its Poké Ball at night.